Seville is considered one of the best travel destinations in Spain. As home to flamenco dancing, you shouldn’t be surprised that Seville is an entertaining city to visit and must for any Spain itinerary. The abundance of festivals, tapas bars, and food markets make it a fun city to get lost in. Without a plan, it can be easy to get swept away in the excitement of the city and not check out all the sites you want to see. It’s especially difficult to see everything when you’ve just got one day in Seville. Need help getting started? Plan your trip with this complete one-day Seville itinerary. A one-day Seville itinerary doesn’t leave you with a lot of time. 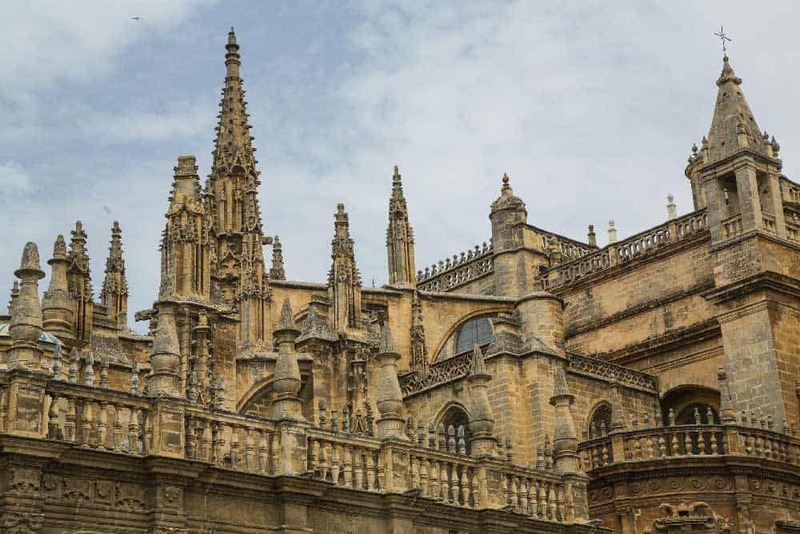 With this guide, you’ll get to see a few of the top attractions in Seville, including Gothic cathedrals, flamenco shows, and museums. You may even have time to take a trip down the river. You’ll start in the historic centre of the city and work your way around some of the most popular neighbourhoods. Just make sure you bring your walking shoes, as this trip involves a lot of walking. 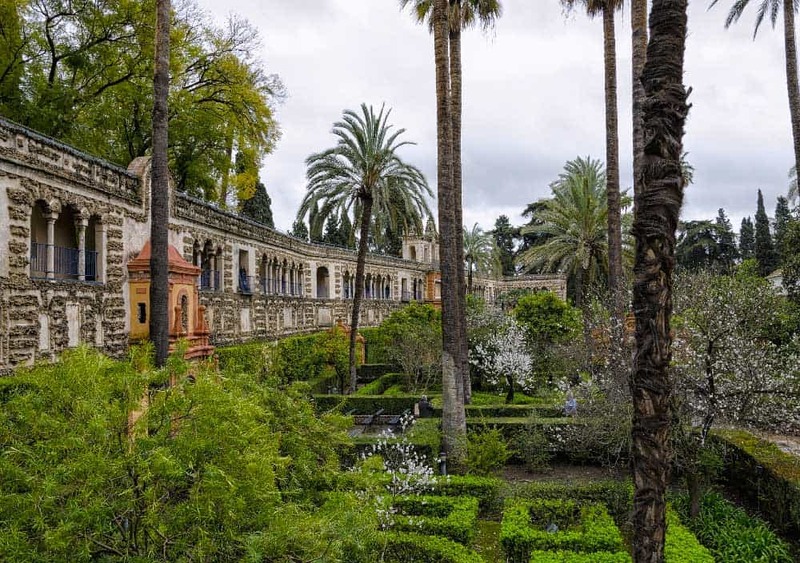 Preparing for your Seville itinerary? Don’t forget to protect yourself with travel insurance! You’ll start your day with a quick trip to Bar Duenas. This small restaurant offers home-cooked meals and opens at 8AM. You can grab an early meal before crossing the street and visiting a fifteenth-century palace. Palacio de las Duenas was built in the late 1400s and became the Seville home for the Dukes of Alba until the 19th century and features a massive collection of art. Audio tours are available, but you’ll want to watch your time carefully. Your first 24 hours in Seville, like many of our 1-day city itineraries, doesn’t include a lot of spare time if you want to see as much as you can. While you should skip the audio tour, you should still explore the palace grounds. The exterior of the building is covered in colourful plant life and climbing vines. The interior features long passageways and tall ceilings. The main courtyard is one of the top features of the palace. It includes wide arches with intricate details. The palace doesn’t open until 10AM. Depending on how long your breakfast takes, you may need to wait a few minutes before getting in. If you find yourself waiting, check out the Convento de Espiritu Santo next door. The baroque church is worth spending a few minutes in and it’s open 24 hours a day. It’s now time to check out another palace. Head south on Calle Dona Maria Coronel. This will take you to Plaza Cristo de Burgos, which is located just a few dozen meters from your next destination. The total walk should only take about nine or ten minutes unless you get distracted by the unique Seville architecture along the way. Like the previous palace, Casa de Pilatos was built toward the end of the fifteenth century. It’s now a museum and is open to the public. You can explore various patios and gardens. While it’s not as grand as Palacio de las Duenas, it’s still a beautiful example of historic architecture and mixes Renaissance, Mudejar and Baroque styles of architecture. An audio tour is also available, which you may not have time to complete. The palace is impressive without the history lesson, however. You can view the detailed tile work on the ground floor and then check out the private residence on the upper floor. When you leave the palace, head west on Calle Aguilas. You’ll walk about four minutes before reaching a fork in the road. Take the left route and walk south for a minute or two until you see the Flamenco Museum. If you’re searching for interesting things to do in Seville, you’ll enjoy your trip to the Flamenco Museum. It’s part of the history of Seville and is the best place in the world to see a true flamenco dance performance. Unfortunately, you may not get to see a show with a one-day Seville itinerary. You’ll need to visit the museum’s website to check performance times during the season that you visit. If midday shows are available, purchase your tickets online and try to get there a little early. If you miss out on the show, you can still tour the museum. The tour includes several informative videos that help explain the origins of flamenco dancing. After leaving the museum, you’ll likely be ready for lunch. Luckily, every street on which you travel on the way to the next palace includes at least a few cafés and restaurants. 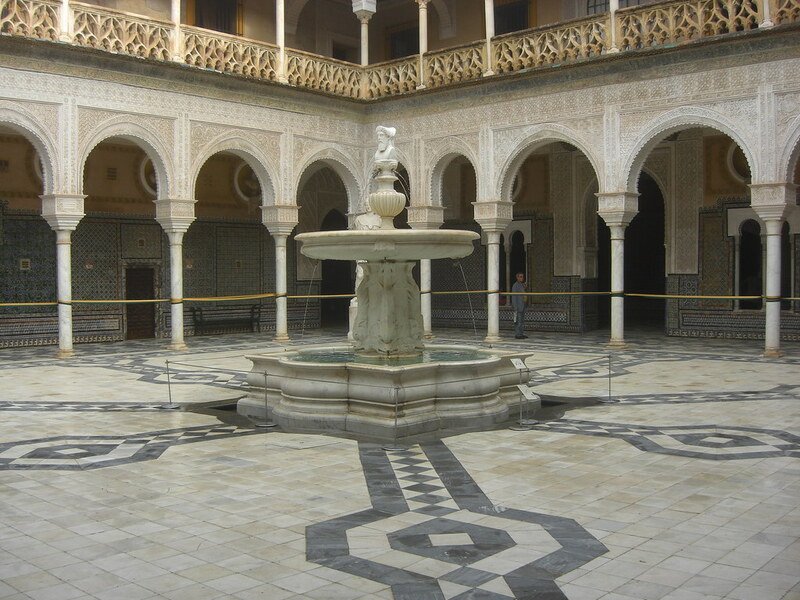 The Royal Alcazar of Seville is about ten minutes from the flamenco museum. On the way, look for a café or restaurant that doesn’t look too busy and stop for a quick lunch. Lunch happens to be the most important meal of the day in Seville, and it’s a good time to try the serranito, the city’s signature sandwich. When you finish eating, continue to the Royal Alcazar of Seville. This royal palace is one of the top Seville attractions and is impossible to miss. The palace and its grounds cover an entire city block. There are dozens of areas to explore, including the carefully maintained gardens. The architecture is quite unique, featuring some of the best elements of early European and Islamic design elements. As one of the most popular tourist spots in the city, you can expect a long wait in line. Consider purchasing your tickets online to avoid the wait. The various courtyards and rooms on the lower floors are mostly open the public, but the upper floors require an extra ticket and tighter security. The palace is still used by the royal family of Spain when they’re in the area and their private residence is on the upper floors. When you finish touring the palace, it’s time to visit another historic site. Walk southwest toward the river. The short, ten-minute walk takes you past a few other landmarks, including Torre Abdel Aziz and Real Casa de la Moneda de Sevilla. Perhaps on your next trip to the city, you can take time to check out these sites. For now, you’ll have to settle for Torre del Oro (Tower of Gold). This thirteenth-century watchtower was built by the Almohad Caliphate. It’s now a museum and was recently restored. You can view historical documents, navigational instruments, and nautical charts that have survived for hundreds of years. Some people find the museum to be a little tacky and over-priced. It’s still worth a short visit, especially as it gives you a chance to check out the river. If it’s still early in the day, you can take a trip down to the river to see if any boat tours are available. 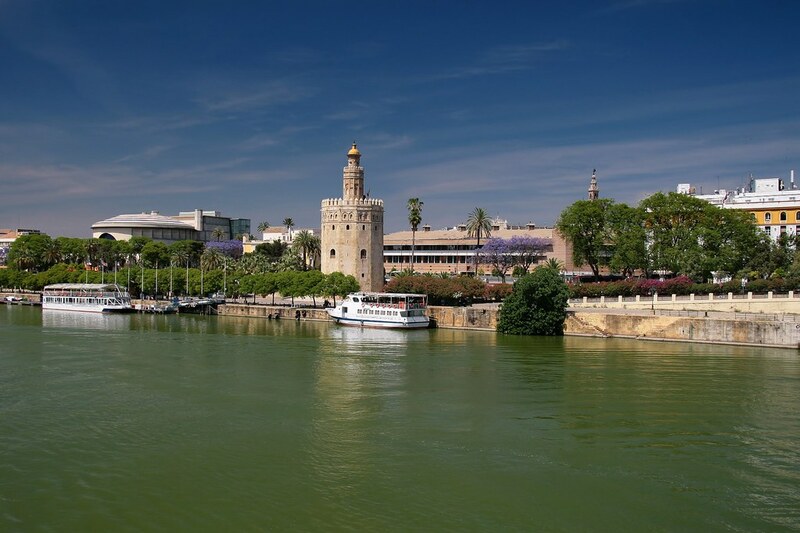 These tours take you along the Canal de Alfonso XIII, giving you a different view of Seville. After a trip to the watchtower and possibly a short cruise up and down the river, it’s time to start your return trip. Walk north from the tower for about ten minutes, passing the royal palace on your right, to reach Catedral de Sevilla (Cathedral of Seville). When this cathedral was first built in the sixteenth century, it was the largest cathedral in the entire world. The massive building covers 23,500 square meters and includes a mixture of architectural influences due to the passing of ownership through the centuries. The cathedral began as a mosque in the twelfth century and was Christianized after the Christian conquest. Work on the Gothic cathedral began in the late 1400s. The massive cathedral is awe-inspiring due to its size and intricately detailed wall mouldings. One of the most interesting features of the cathedral is the tomb of Christopher Columbus. You can see the resting place of one of the first European explorers to reach the Americas. When you’re done walking around Seville Cathedral, your stomach may be grumbling for dinner. Food is just around the corner. On the east side of the Cathedral, you’ll find Santa Cruz. This charming neighbourhood is one of the best places to visit in Seville. It mostly caters to tourists, which is great, as you’ll find a wide selection of food and shopping. The Barrio de Santa Cruz was constructed largely during the eighteenth century as part of an urban renewal process. A lot of the old layout remains, including the labyrinth of narrow alleys and streets. 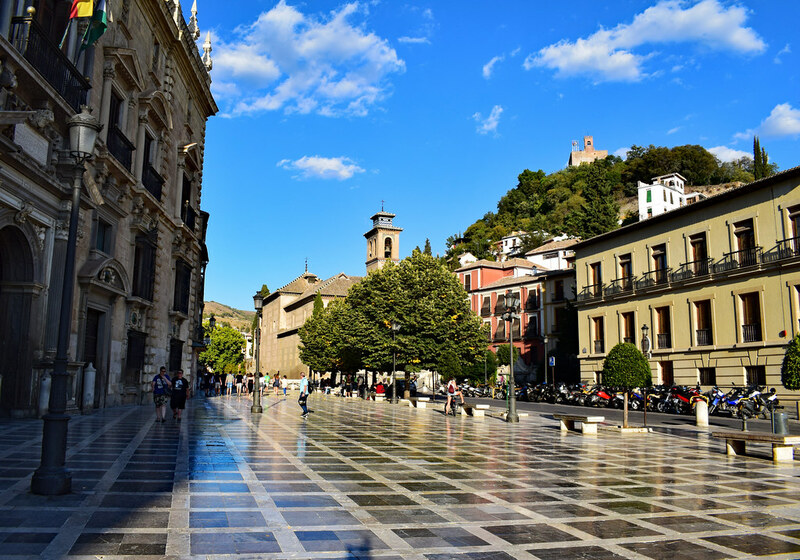 These streets often open to plazas and public squares, some of which contain cafes, bars, and restaurants. Wander around to choose a place to eat. If it’s not too crowded, try Bodega Santa Cruz Las Columnas. This authentic tapas bar offers local cuisine, Mediterranean dishes, and vegetarian-friendly options. After getting some food, spend time getting lost in the labyrinth of streets. Check out some of the small shops. You can find everything from small souvenirs to handmade scarves or original art. It’s now time to walk off your dinner by heading toward another public square. Plaza Nueva is included on every list of the top attractions in Seville and is located about six minutes from the Santa Cruz neighbourhood. Plaza Nueva is in the centre of the city across from city hall. You’ll also find the train station, hotels, restaurants, bars, and more shopping. While many people start their tour of Seville in this square, it’s also a great place to end your one-day Seville itinerary. You can find everything at Plaza Nueva. You can shop, eat, drink, or simply watch people. If you’re done for the day, you can take a train back to your hotel or (if you’ve thought ahead) book a room at one of the hotels surrounding the square. For night owls, travel any of the blocks directly adjacent Plaza Nueva and you’ll find bars and clubs open that remain open late. Welldone Antiquarium: An excellent value hotel that over-delivers with large rooms with kitchenettes for your self-catering pleasure. The communal terrace is a fantastic touch & a favourite for guests. H10 Corregidor Boutique Hotel: This boutique hotel, built around a lovely courtyard, is the perfect introduction to Andalusia. Rooms feature simple & elegant decor with comfortable beds and modern amenities. Hotel Gravina 51: Set in an 18th-century manor house, this graceful hotel gives off a truly traditional Andalusian vibe that every guest will fall in love with. The location, close to some of the Seville’s top attractions, is simply superb. Hotel Casa de Poeta: A 4-star brimming with style, this top luxury pick features classy & comfortable rooms that’ll make your stay as blissful as possible. Seville Cathedral and The Alcazar are within walking distance.